I'm often asked if our collection of Funny Teacher Award certificates can be used as Funny Student Awards? The answer is a resounding yes! The Germophobe Award: for cleanest desk. The American Idol Award: for being most likely to break into song. These are just a few of the funny awards ready to print with no customization needed. There are dozens where you could change a word or two to make them applicable to students. For some you'd have to use the customized template to reword, but still it is a HUGE time-saver for you! You could use these funny awards for elementary, preschool, kindergarten, middle school, high school, graduation, or reunions. 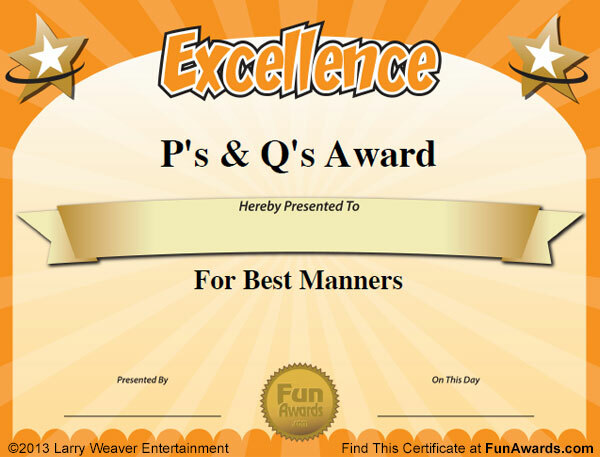 Bookmark our site and check back for more funny kids awards, silly student awards, ideas, certificates, titles, templates, categories and more funny student awards!